The venerable Kimball Theater now boasts a state-of-the-art renovation—and a new name. Francis Xavier Seelos Theater was officially introduced to the College community at a dedication and blessing on Friday, Sept 5. The new theater is named in honor of Blessed Francis Xavier Seelos, C.Ss.R. (1819-1867), the Redemptorist priest and missionary, known for his tireless work with the poor and immigrant communities in the United States. He was beatified by Pope John Paul II in 2000. Located on the north side of Kimball Dining Hall, the former bowling alley-turned-movie theater (built in 1932) had been a long, dark space, suffering from less-than-ideal sight lines and substandard lighting and sound. Because of those constraints, the College was severely limited in the kinds of programs that could be presented. After a year of planning and construction, the 360-seat theater is open for business, complete with a new lobby and reception area. The renovated theater has more steeply raked seating, and there is a new projection booth with a full suite of audio-visual support, Dolby Digital surround sound, acoustic ceiling, and flexible lighting. In addition, the stage now features locations for three lecterns, which will allow for a greater range of events. 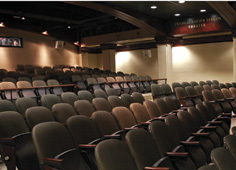 Other academic areas will also be able to take advantage of the theater. The space will accommodate department events and meetings; and on-campus groups can utilize it for concerts, dance performances and other entertainment. The College’s popular film series, which is open free to the public, will continue to be held there. At the dedication, the space and a bronze statue of Fr. Seelos were blessed by Fr. McFarland, assisted by Very Rev. Thomas D. Picton, C.Ss.R., provincial superior of the Redemptorists of the Denver Province, and Rev. Byron Miller, C.Ss.R., director of the National Seelos Shrine and Seelos Center in New Orleans. Also in attendance was the Seelos statue sculptor, Franco Alessandrini. The College worked in consultation with Lamoureux Pagano Architects, Worcester, on the renovation and design of the new space.